After the huge success of last year’s event, the Foxlake Outdoor Festival returns bigger and better for 2017. Head along the East Lothian coast to the beautiful surroundings of Foxlake Adventures, Dunbar, in May for an exhilarating weekend offering a world of adventures for all the family. Following the massive success of this event in 2016, when the first ever Foxlake Outdoor Festival sold out weeks in advance, Foxlake Adventures in partnership with East Lothian Council, have decided to extend the festival to a full weekend across the 20 and 21 May 2017, offering families and individuals the opportunity to get outdoors and begin their own adventure in East Lothian. There will be tickets available for each day, weekend tickets and once again children’s tickets will be absolutely free. Tickets will start at £17 for an adult day entry and £30 for a weekend ticket, but if you purchase prior to the end of February, you will receive an early bird offer of £14 for an adult day entry and £25 for a weekend ticket. Again children’s tickets will all be free! Many of the hugely popular elements of last year’s event will return in 2017, including the Industry Wake Parks who will once again run an Industry Pro Wakeboard Tour Event. Bringing some of the most talented wake boarders from around the world to compete, this is a further growth of Scotland’s biggest wakeboard event. This is the perfect opportunity to enjoy and watch the thrills of professional wakeboarding. Also returning is the Decades Music Stage, featuring everyone’s favourite tribute bands, celebrating the last 60 years of music, something for everyone. There will be a talented line-up of East Lothian’s finest local musicians, and joining them this year will be the Comedy Stage, with a selection of Britain’s finest comedians guaranteeing laughs throughout the weekend. To keep the children entertained we will be bringing back our popular Kids’ Zone with the inflatable village filled with every bouncy castle imaginable, they can also take on the challenge of the climbing wall and even get their faces painted. The weekend is all about getting the family active outdoors, so you will have the chance to try out some of East Lothian’s outdoor adventures for yourself. Try out the Foxfall Course, the UK’s only rope course constructed over water, or get on your wet suit and give wakeboarding a try, or if you prefer to stay dry, hop on and master a segway! The programme continues to expand and we will be adding activities throughout February to offer the most thrilling world of adventures at the Foxlake Outdoor Festival in May 2017. East Lothian’s Economic Development Strategy works with the local tourism industry to position the county as Scotland’s leading coastal, leisure and food & drink destination. The organisers of Gardening Scotland – the country’s national outdoor living show and garden festival – have launched a brand-new, nation-wide competition to find Scotland’s best gardener, and people in East Lothian are being urged to apply. The Gardener of the Year award is open to anyone with a passion for creating inspiring outdoor spaces, from novices to experts, young to old and amateurs to professionals. Everyone can apply, and people can also nominate friends, colleagues or relatives. The new award has been launched in order to celebrate the skills and enthusiasm of gardeners up and down the country, from vegetable growers to chrysanthemum exhibitors to budding garden designers and primary school allotmenteers. The winner of the award will be selected by an expert panel of judges who are looking for a gardener with infectious enthusiasm, a drive to learn and a passion for gardening. The announcement will be made at Gardening Scotland 2017, which takes place at the Royal Highland Showground, Ingliston, from 2nd – 4th June. The lucky winner will receive, amongst other prizes, £250 of Caulders Garden Centre vouchers to spend on transforming their own outdoor space. “Gardening Scotland is a celebration of all things related to the great outdoors. We know for a fact there are thousands of outstanding gardeners who never get recognised for their hard work and commitment to gardening – we want that to change, which is why we’re launching this new award. Now in its 18th year, Gardening Scotland is a celebration of gardens and everything related to the great outdoors, encompassing horticulture, gastronomy and family-friendly entertainment. Conservation and education charity, the Scottish Seabird Centre, North Berwick, announces the appointment of Simpson & Brown Architects for the National Marine Centre project. The Simpson & Brown team worked on the original, award-winning Scottish Seabird Centre building which opened to the public in May 2000. The Seabird Centre has become a very popular landmark building and has won several architectural and sustainability awards. The success of the Seabird Centre led to Simpson & Brown being appointed to design other visitor attractions. Over the last 16 years they have worked on, and won awards for, a range of high profile visitor-related projects including the Robert Burns Birthplace Museum, the Dawyck Gateway at the Royal Botanic Gardens, the Arbroath Abbey Visitor Centre, York Art Gallery and, most recently, Rievaulx Abbey Visitor Centre and Museum to name but a few. They also designed the Scottish Ornithologists’ Club building at Aberlady. With over 38 years’ experience, Simpson & Brown specialise in conservation projects, creative adaption of existing buildings and the design of environmentally-sound initiatives. The project team will be led by Partner, Andy Davey, with Partner, Susan Whittle and Associate, Jenny Phillips. Andy Davey, Partner at Simpson & Brown Architects, said: “Our team is delighted to be involved with the National Marine Centre Project. We are immensely proud of the Seabird Centre building and believe we are ideally placed to develop and strengthen the design to make it even more inspirational as well as functional for visitors and staff. Grace Martin, Project Director for the National Marine Centre, said: “We are thrilled to be working with Simpson & Brown. Andy and his team have a very strong association with the current building and a wealth of experience in visitor attractions, sustainability and sympathetic design. “It is still very early days with the project and we are currently in a period of public consultation. 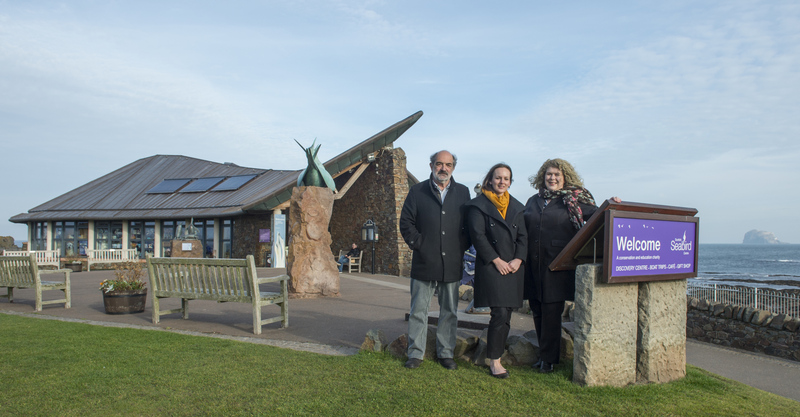 Going forward, Simpson & Brown will be keen to engage with visitors and non-visitors alike to help them identify how best to enhance the existing, iconic Seabird Centre building”. The aim of the National Marine Centre is to help people discover more about our amazing marine environment and wildlife – life above and below the waves – including seabirds. It will present the opportunity for the Centre to achieve more of its charitable objectives by expanding and diversifying its education and conservation programmes, developing new activities and events, and enhancing the exhibition space. The National Marine Centre is the working title for this innovative project. East Lothian based Bidding Consultancy Wins Graduate Employer of the Year Award! East Lothian based Bid Specialists, AM Bid Services were thrilled to be crowned winners of the coveted ‘Best Employer for Student & Graduate Recruitment’ Award at the 2016 Midlothian and East Lothian Chamber of Commerce Awards. The exciting news broke at the high profile Awards Ceremony which took place on Wednesday 26th October at The Brunton Hall, Musselburgh. Over 300 members of the Lothians business community were in attendance to hear keynote speakers Chris Stark, Director of Energy & Climate Change at the Scottish Government; Keith Barbour, President of Midlothian and East Lothian Chamber of Commerce; and George Archibald, Chief Executive of Midlothian and East Lothian Chamber of Commerce. The ‘Best Employer for Student & Graduate Recruitment’ Award AM Bid Services received was sponsored by Queen Margaret University, where graduate employee Dane Thomson successfully gained his 2:1 BA (Hons) PR & Marketing degree. Speaking of his excitement at winning the award, AM Bid Services Managing Director, Andrew Morrison said: “Winning the award is an important recognition of the journey that AM Bid Services and our graduates are on. I have been hugely encouraged by the passion and commitment Cameron Houston and Dane Thomson have shown in seizing the opportunity to begin their careers with AM Bid Services. The ScotRail Alliance has published details on how they will improve train service performance. The Performance Improvement Plan (click to open pdf) sets out actions that are being put in place to improve the reliability of trains and to ensure that the train infrastructure – including points, tracks and signals – is operating to its optimum efficiency. The plan also covers improvements to the way train services are operated – including the identification, monitoring and protecting of ‘Golden Trains’. These are the services that, if delayed, have the biggest impact on the rest of the rest of the rail network. The publication comes as the ScotRail Alliance steps up its work to prepare for Autumn – traditionally one of the most difficult periods for train operators across the UK – by rolling out its fleet of specialist trains to clean the tracks of falling vegetation. ScotRail Alliance Infrastructure Director, David Dickson said: “We are not a just a company made up of metal boxes, wooden sleepers or concrete buildings. We have 7500 people working for us – and every single one of them is dedicated to doing the very best for our customers. “Our railway is undergoing the biggest period of change and modernisation since the Victorian era. Over the course of the next year or so we will be completing huge projects to upgrade our infrastructure, electrifying large parts of the network and introducing new fleets of faster, longer greener and intercity trains. “All of this work will transform rail travel in Scotland. We will have shorter journey times, better equipped trains and, crucially, a huge expansion in the number of services we run and the seats we are able to offer. When we complete this work, there will be a hundred thousand more seats available each and every weekday than there was at the start of the current Franchise. On the plans to prepare for Autumn, David Dickson added: “Autumn is one of the most difficult periods for all rail operators across Britain. Leaves on the line has become a cliché over the years, but the problems that are caused by wet weather and vegetation are all too real. “Leaf debris on the tracks can cause train wheels to slip – increasing breaking distances and making conditions more difficult for our drivers.